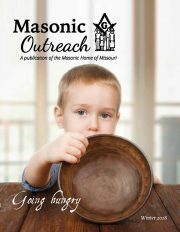 This program is a way for the Masonic Home to recognize and thank our Missouri Masonic Veterans. Once a Masonic Veteran is identified, the Masonic Home will send a veterans lapel pin as a small token of appreciation for his or her service to our country, as well as special mailings throughout the year. In Fiscal Year 2018, we thanked 1,650 Missouri Masonic Veterans for their service. Please help us identify Masonic Veterans and provide us with an address, date of birth, branch of service, and service dates. Contact the Masonic Home at 800-434-9804 to add the veterans in your Lodge or Chapter.